At Outsource2india (O2I), a team of AutoCAD wizards convert legacy drawings and blueprints into digital formats and simplify editing, storage, and retrieval processes. Over the past two decades, O2I has supported the growing need for engineering drawing digitization. As a preferred partner to offload clients' non-core CAD conversion process, it has garnered a list of global engineering clientele including Fortune 1000 companies. O2I follows ISO 2008:2009 quality standards, which enables its AutoCAD conversion service quality assurance dependably over 99%. Quality, project turnaround time, and the economical pricing option is what makes O2I a chosen offshore company for architect, civil, mechanical, and other engineering firms. We have created a niche for ourselves in AutoCAD design and conversion service industry with over two decades of experience to back us up. With an ever-increasing list of clients from around the globe, we are amongst the top choices as a conversion service partner, owing to our scalable, quality-centric, flexible and effective delivery model. Our quality-driven project delivery process flow is designed to include validation of excellence in terms of input as well as output data to ensure steadiness. We also include customer feedback in every phase to meet client needs in the closest possible manner. Quick Turnaround Time - We strive to complete your projects within the stipulated delivery time. Outsource2india has been into CAD Conversion and Digitization services for more than 14 years. The experienced, multi-disciplinary team has the expertise in civil, mechanical, electrical and architectural drawings. We offer high quality design concepts at highly competitive prices with probably the quickest turnaround time and this has helped us service close to 50+ International clients. Read the case study to know how O2I Helped 70-year-old Fruit Processing Equipment Manufacturer with 3D SolidWorks Drawings. Read the case study on how O2I Helped 50-year-old Renowned Drilling Services Provider with Legacy Drawing Conversion. Do contact us and we will be able to offer some of the best in class solutions for CAD conversion/digitization services. To find out more about outsourcing your AutoCAD Conversion to Outsource2india, fill our inquiry form and our Customer Engagement Team will contact you within 24 hours. 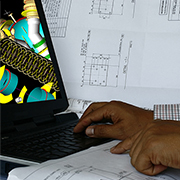 Contact us to learn more about our CAD conversion services today.